What is the cost of course materials for a transfer degree at each community college in Oregon? Part 1 of this post, Why do we need this research?, provides the context for the data presented here. This post presents a summary of findings, along with the method and results of the research. The complete report is available at Course Materials Research Report. When we talk about the cost of textbooks at Oregon’s community colleges, how much money are we really talking about? Open Oregon used a standard methodology to gather locally relevant cost data that could be easily compared across institutions. The statewide average materials cost for a 2-year degree is $2,142.84 for the AAOT; $2,002.96 for the AS; and $2,316.19 for the ASOT-BUS. 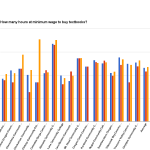 The number of hours at minimum wage ($9.25/hr) to earn that much money is 231.66 hours for the AAOT; 216.54 hours for the AS; and 235.67 hours for the ASOT-BUS. For the AAOT, materials cost $23.61 per credit, 20.23% over tuition cost; for the AS, materials cost $21.95 per credit, 23.49% over tuition cost; and for the ASOT-BUS, materials cost $25.30 per credit, 27.19% over tuition cost. The typical Oregon community college transfer degree student is likely to incur materials costs that are just a little under the College Board’s national average of $1,364 per year for materials, or $2,728 for two years. Redesigning courses around open educational resources can save students a significant portion of this money. Bookstore managers are at the front lines of affordability. Through used book and rental options, they offer an average savings of over $1,000 on AAOT degree materials. Our campuses are an ecosystem and we all need to work together toward the shared goal of student success – we don’t want to put the bookstore out of business, but we also recognize that students need affordable access to their course materials. There is great work going on right now in Oregon’s community colleges, as evidenced by over 100 adoptions recorded to date on the Open Oregon Resources page. More and more faculty are taking the time to thoughtfully redesign their courses around lower-cost materials, with and without the help of grant money and other incentives. We have a chance to reduce textbook costs by 10% or more in the next biennium. We intend to repeat this research year after year to track our progress toward making textbooks affordable to more students. Oregon is poised to put the elements together and create a significant change. A recorded presentation on this research is available at Archived webinars: OER Research. How much does it really cost to buy the textbooks for a two-year degree in Oregon? 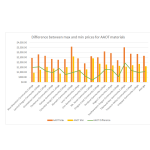 Rather than rely on national estimates of materials expenses, Open Oregon participated in an informal research project coordinated by SPARC to develop locally relevant data to answer this question. The short answer is that the typical community college transfer degree student is likely to incur materials costs that are just a little under the College Board’s national average. While this data was collected using a different methodology than the College Board uses, both numbers make one thing clear: textbook costs are a problem for students both here in Oregon and across the country. Redesigning courses around open educational resources can save students a significant portion of this money. This project would not have been possible without the assistance of all 17 of Oregon’s community college bookstore managers. Collaborating with them made very clear the extent to which campus bookstores are on the front lines of affordability. They negotiate with publishers for the best possible deal, but there is only so much that they can do to control costs because they don’t choose the books in the first place. One manager described getting out her purse to buy a book for a homeless student. The data presented below was double-checked by each bookstore manager. In some cases, where courses aren’t offered every term, they looked up price information from previous terms. They offered advice about which courses are continuations that reuse a book from a previous term. They used their expertise to ensure the accuracy of the numbers collected for their colleges. The data on traditional textbooks is grim: according to data provided by the National Association of College Stores, between 2007-2013 the average price of a new textbook increased from $57 to $79 – a 38% increase in just 6 years. Bookstores are often concerned that OER will hurt their bottom line, or affect their ability to meet general fund contribution targets. However, bookstores may find that they sell more copies of printed OER than traditional textbooks, so the increased market share can offset the lower price. Our campuses are an ecosystem and we all need to work together toward the shared goal of student success – we don’t want to put the bookstore out of business, but we also recognize that students need affordable access to their course materials. This research looked at textbook costs for three of Oregon’s transfer degree programs: Associate of Arts Oregon Transfer (AAOT), Associate of Science (AS), and Associate of Science Oregon Transfer-Business (ASOT-BUS). Community college students who complete a transfer degree will be accepted at a 4-year college or university with their first two years of lower-division requirements completed. While not all transfer degrees are offered at each community college, they are all accepted at Oregon’s public universities as well as many private colleges and universities. These degree pathways are obvious places to focus efforts toward textbook cost reduction because they include foundational requirements that apply to many other degree programs as well, greatly extending the impact of any change in course materials cost. The course requirements for each of the transfer degree programs are specified in the course catalog for each college (for example, worksheets from Portland Community College show requirements for AAOT, AS, and ASOT-BUS). While there are a few specific courses required for each degree, there are many possible ways to meet the requirements for disciplinary studies and electives. Therefore, where there were multiple options to meet a requirement, this research used the course with the highest enrollment at that college to fill in the blank. Data on course enrollments for each college was provided by the Office of Research and Data of the Oregon Higher Education Coordinating Commission from the most recent year available, 2013. This program doesn’t represent a pathway or sequence that any individual would take, but rather looks at the courses that students collectively take most often at each college. This is where cost reductions can have the greatest impact. The next step was to visit each college bookstore’s website and look up the required textbooks for each of the courses for the current term. If multiple sections of the course were being taught, the first one on the list was selected. This arbitrary choice accounts for the fact that students often can’t choose their courses based on textbook cost because of competing priorities such as work schedules or childcare. The data collected meets the requirements of the research project methodology that other campuses participating in this project used: for each course, the most and least expensive options for the total cost of materials was recorded. If one book could be used for more than one course in a series, its cost was only counted once. Where the bookstore provided price comparisons with external retailers, the lowest-cost option was selected. This research method calls for both the maximum and minimum price in order to capture the situation faced by students in more detail. The maximum price represents what the syllabus asks of them. The low number represents the bare minimum that they could spend via the bookstore in order to access the required materials during the course – though they may not be able to retain the materials for future reference if they are rented. The research didn’t account for the many other ways students access their books. These methods include creative ways of downloading, sharing, using library course reserves, or simply hoping to pass the class without the book. When the first part of this post was published, the College Board’s estimate for students at public two-year colleges was $1,328 per year for books and supplies. The 2015-16 College Board report is now available, and not too surprisingly, the estimate has gone up: students at public two-year colleges should now expect to budget $1,364 per year for materials, or $2,728 for two years. On average, Oregon colleges are a under that number, though some colleges are on par or above the national average. This comparison to College Board data is not apples-to-apples because the two figures are derived from different methods, but the national data provides a useful point of reference. This data is not intended to be used to rank Oregon’s colleges. Because it is a snapshot it doesn’t have the degree of accuracy needed to make useful comparisons. Rather, it may be seen as a record of the kinds of initiatives and faculty choices that are working well throughout the state. Table 1, left, shows the average cost of materials for each of the transfer degrees at each college (averaging the high and low costs for each degree). 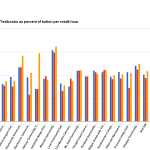 The last entry on the x axis presents an average of the numbers in each column. Based on this data, the statewide average materials cost for a 2-year degree is $2,142.84 for the AAOT; $2,002.96 for the AS; and $2,316.19 for the ASOT-BUS. 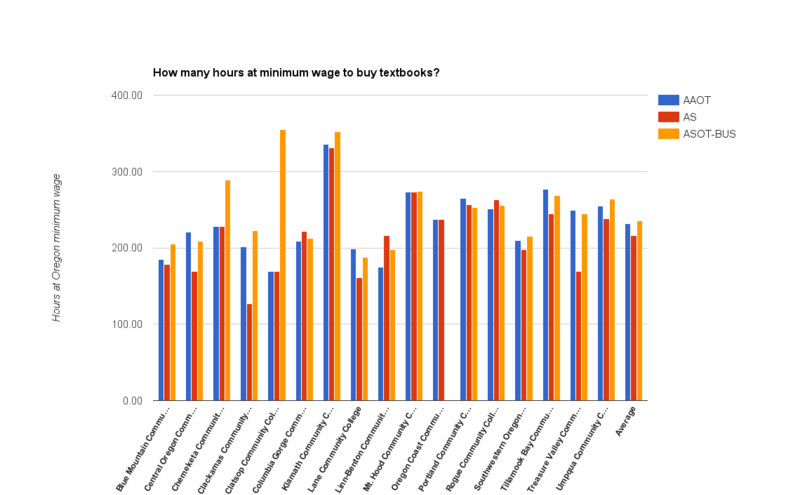 Table 2: How many hours at minimum wage to buy textbooks? Table 2, right, presents the number of hours it would take at Oregon’s 2015 minimum wage of $9.25/hr to pay for those average materials costs. Note that Oregon’s minimum wage is changing this year, and not all community college students earn minimum wage. We also know that Idaho, Washington, and California students work in their home states but take courses at Oregon community colleges (sometimes paying out-of-state tuition as well). The statewide average number of hours at minimum wage is 231.66 hours for the AAOT; 216.54 hours for the AS; and 235.67 hours for the ASOT-BUS. Table 3, left, compares cost of course materials to tuition cost. Because the colleges handle fees differently, this comparison looks only at tuition per credit hour. Looking at statewide averages: for the AAOT, materials cost $23.61 per credit, 20.23% over tuition cost; for the AS, materials cost $21.95 per credit, 23.49% over tuition cost; and for the ASOT-BUS, materials cost $25.30 per credit, 27.19% over tuition cost. 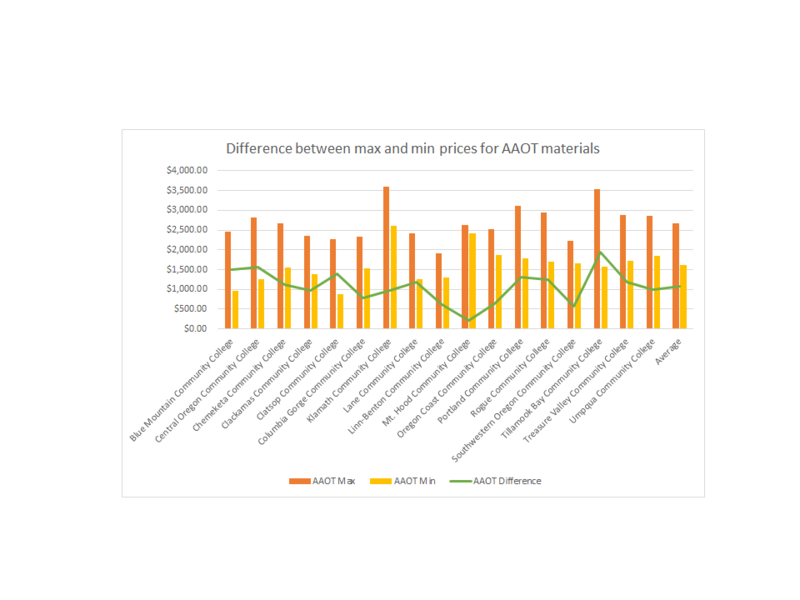 Last, Table 4, right, considers in more detail the difference between the maximum and minimum materials costs for the AAOT. This data shows the effort that bookstore managers are making to keep textbook prices down for AAOT courses. Through used book and rental options, they offer an average savings of over $1,000 on AAOT degree materials. The data supporting these tables can be found in the Aggregate Statewide Data spreadsheet. Data for each college is available upon request. What does this tell us? What’s next? As a result of this research, we know that Oregon community colleges, on average, are slightly below the College Board’s national average of $1,364 per year for course materials. Students can expect to spend many weeks’ worth of wages on their textbooks. Textbook costs are a problem for students both here in Oregon and across the country. 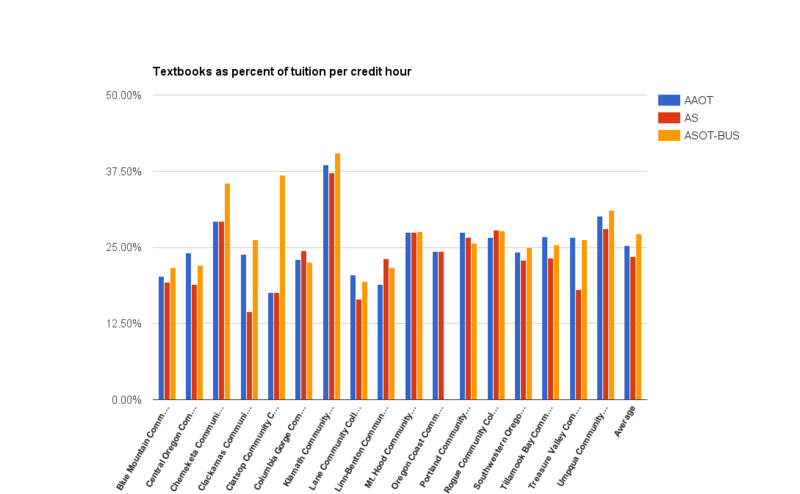 Having this data on a very local level offers insights into why textbook costs are often correlated with other student success measures. When we know that buying textbooks is like paying tuition for an entire extra course each quarter, we have a potential explanation for why these costs have an impact on retention and time to degree. We also have a clearer picture of which courses we can prioritize converting to OER for the highest immediate impact on student spending. This is fascinating and incredibly useful. Is there any chance that this research will be replicated for the four-year institutions? I love seeing this information and will be using it to compare where our store is “today” vs the 2013 data used for the project. We have worked very hard over the last few years bringing the cost of textbooks & course materials down. It gives me a great benchmark to work from and show the progress we have made, and continue to make in our bookstore. We have the same goals for our students and want very much to work together with our Faculty & staff to reach them. Thanks for your comment, and for your research help, Micque! UCC is doing fantastic work on textbook affordability.